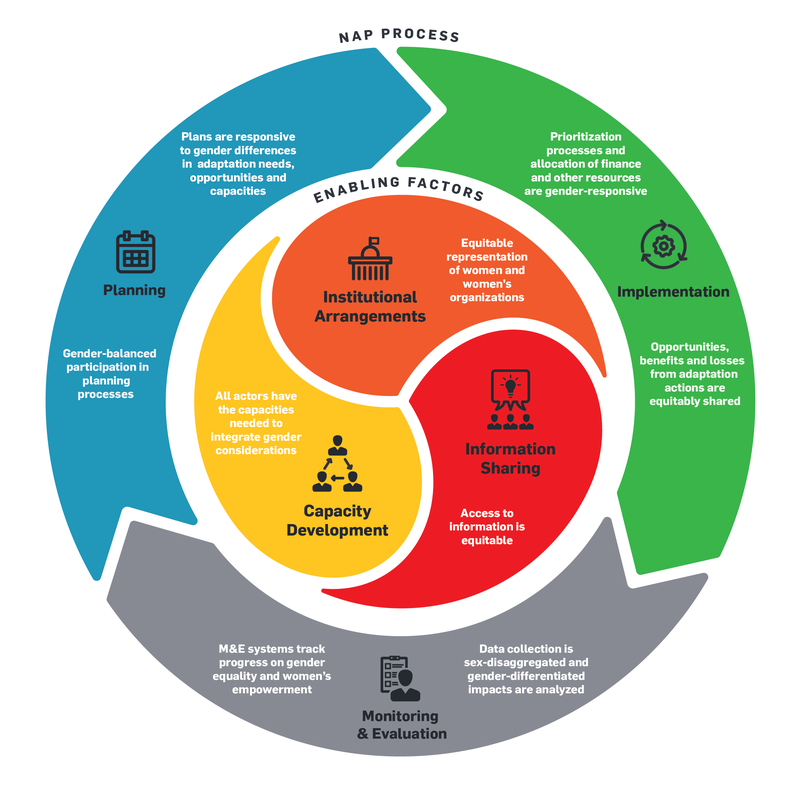 Figure 1 from page 4 of the brief: A Framework for Gender-Responsive National Adaptation Plan (NAP) Processes. Click to enlarge. With the adoption of the Sustainable Development Goals (SDGs) and the Paris Agreement under the United Nations Framework Convention on Climate Change (UNFCCC), increased attention is turning to the synergies between efforts to address climate change and those to achieve sustainable development (Hammill & Price-Kelly, 2017). One key area of intersection is the efforts to integrate gender equality across both processes. This brief* discusses this issue in the context of the formulation and implementation of National Adaptation Plans (NAPs) (hereafter referred to as “NAP processes”). It presents the rationale for considering gender issues in climate change adaptation and introduces a working framework for gender-responsive NAP processes, including a table of key issues for NAP teams to consider (page 5 of the brief). It aims to promote discussion and reflection on integration of gender by actors engaged in NAP processes. The framework builds on previous guidance developed by the UNFCCC Least Developed Countries Expert Group (available here) and International Union for Conservation of Nature (IUCN) (available here). It has been developed as part of an ongoing initiative by the NAP Global Network to promote gender-responsive investments in climate change adaptation. *Download the brief from the right-hand column. For details of references see the brief. To learn more about gender and social equity issues in climate change adaptation browse the Gender and Social Equity theme page. Why a Gender-Responsive NAP Process? Addressing gender considerations in NAP processes adds an additional layer of complexity to an already complicated, multi-dimensional process. So why is this so important? First, gender equality is a universal human right as acknowledged with the adoption of various international instruments, including the 1948 Universal Declaration of Human Rights and the 1979 Convention on the Elimination of All Forms of Discrimination against Women, among others. It is at the centre of the SDGs, as both a stand-alone goal and a cross-cutting issue across a number of other goals to be reached by 2030 (United Nations, 2015). These commitments represent a strong statement by the global community that gender equality is a priority. Second, adaptation efforts will not be effective or sustainable if they do not take gender into account (UNFCCC, 2015a). Women, girls, boys and men experience the impacts of climate change in different ways and have different needs, opportunities and capacities to respond. In many contexts, women face additional barriers to adaptation compared to their male counterparts due to social norms and practices that limit their access to information, resources and opportunities (IUCN, UNDP & GGCA, 2009; CARE, 2010). If these issues are not considered in NAP processes, there is a risk that they will maintain, exacerbate or create new gender inequalities. For example, studies have found that in some cases adaptation actions have led to increased workload and reduced decision-making power for women (see for example Sovacool & Linner, 2016). Consideration of gender issues therefore provides a critical basis for understanding differential vulnerability to climate change and addressing the underlying causes. Third, the NAP process presents an opportunity to address gender inequalities. By acknowledging gender differences in the process, efforts can be made to empower women as agents of change. Women play key roles in contributing to household food and livelihood security, managing climate-sensitive resources and in community organization and leadership. If NAP processes explicitly aim to harness this capacity and apply it to the challenge of climate change, it can help overcome traditional barriers to women’s participation in decision making. With equitable and effective participation by women and women’s organizations in adaptation planning, implementation and monitoring and evaluation (M&E), there is a greater likelihood that finance and other resources for adaptation will be channeled in gender-responsive ways, and that the opportunities and benefits resulting from these processes will be more equitably shared. Finally, there is also a policy imperative to integrate gender considerations in NAP processes. In the context of the UNFCCC negotiations, adaptation and gender issues were linked as early as 2001 in the guiding elements for the preparation of national adaptation programs of action (NAPAs) (UNFCCC, 2001). More recently, the decision that established the NAP process noted the need for gender-sensitive approaches (UNFCCC, 2012a), later defined as responding to “the different constraints and needs of individuals based on their gender” (UNFCCC, 2015a, p. 16). The 2015 Paris Agreement took these commitments even further, referring to gender-responsive approaches, as well as to the goals of gender equality and empowerment of women (UNFCCC, 2015b). The Lima Work Programme on Gender and Climate Change, established by the UNFCCC in 2014, was renewed in 2016, focusing on strengthening gender-responsive climate policy, including for adaptation (UNFCCC, 2016a). These recent pledges signal a strong commitment by UNFCCC Parties to integrating gender in responses to climate change, among which the NAP process is a key opportunity (UNFCCC, 2016b). What Does a Gender-Responsive NAP Process Look Like? Approaches to integrating gender considerations in policies, plans and programs range from harmful, where inequitable gender stereotypes are reinforced, to transformative, where social norms and structures are challenged in an effort to achieve gender equality (World Health Organization [WHO], 2002; CARE, 2008). The NAP Global Network understands gender-responsive approaches as those that examine and actively address gender norms, roles and inequalities (WHO, 2009). Gender-responsive approaches go beyond sensitivity to gender differences—they actively seek to promote gender equality (WHO, 2009; CARE & International Center for Research on Women [ICRW], 2007), often through specific actions to empower women in their households and communities as well as broader policy and planning processes (Burns & Lee, 2015). Three factors involved in a gender-responsive NAP process. The figure at the top of this article (click to expand) provides an overview of what it looks like when these considerations are effectively integrated in the NAP process. * Please download the policy brief for full text and much more detail on this topic.